Bonfatto's has a rich and unique history dating back before WWI. Sicilian immigrant, Guy Bonfatto, opened a small grocery store in Pennsylvania in 1910. After a stint in the war, Guy returned to PA and re-opened his grocery store with his new wife, Pauline. Guy and Pauline grew the business (and their family) steadily. The next generation of Bonfatto's maintained the family business after Guy and Pauline's passing. What started as a grocery store, developed into a local hot spot for prepared subs and pizza. Eventually, the family turned the establishment into a full service restaurant. In 1990, David Letterman, grandson of Guy Bonfatto, took over the business. Guy continues to grow the thriving business and has since opened a second location in State College. Now famous for their subs, pizza, steak and wings, Bonfatto's has become a favorite of locals and college students throughout PA.
David was gracious enough to send me several varieties of Bonfatto's Wing Sauce and Marinade. Along with the customary buffalo flavors, Bonfatto's features some truly unique flavors like Apple Pepper Jack, Tongue Thai'd and Razz Hab. 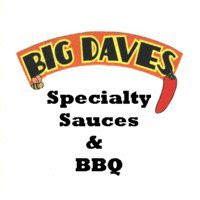 I used a couple of these sauces, including Razz Hab, for our Super Bowl gathering. As the name would indicate, Razz Hab is a Raspberry based sauce spiced with the ultra hot habanero chile. Razz Hab is a thick, sticky sauce with true Raspberry flavor. Red Raspberries are the number one ingredient listed on the label and that becomes very apparent after the first taste. The sauce is extra sweet thanks to the addition of corn syrup. Bonfatto's lists Razz Hab's spice level as "Torch Heat." Out of the bottle, the habanero spice is screaming hot. When the sauce was heated and applied to wings, it lost some its burn. In fact, I found the heat level to absolutely perfect on the wings. It was hot enough to burn, but not so bad that a cold beverage couldn't put out the fire. With a unique blend of real fruit sweet and substantial heat, Razz Hab is a top notch wing sauce. It stuck great to the wings and to my fingers. 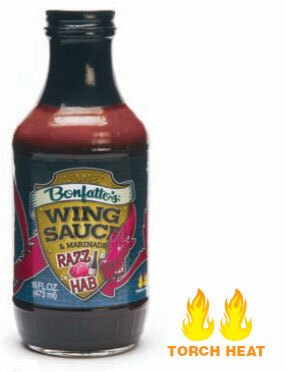 Learn more about Razz Hab and all of Bonfatto's Wing Sauces on their website. See how the sauce rates on our "Product Reviews" page. 2 Response to "Bonfatto's Razz Hab Wing Sauce"
Fruit-based sauces always present interesting flavor profiles. How potent would you say the raspberry flavor is in this sauce? Wayne - it's pure raspberry. Think preserves with a kick.